"Take Me Back to Chicago"
"Alive Again" is a song written by James Pankow for the group Chicago and recorded for their album Hot Streets (1978), with Peter Cetera singing lead vocals. The first single released from that album, it reached #14 on the U.S. Billboard Hot 100 chart. In Canada, "Alive Again" spent two weeks at number 11. 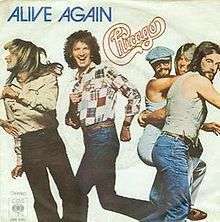 "Alive Again" was Chicago's first new single after their split with producer James William Guercio. It was also their first hit after the accidental death of Terry Kath; Donnie Dacus played guitar on the recording. The opening guitar and horns riff of this song were used in the opening highlights montage by the NBA on CBS from 1979 to 1981. An instrumental version was used as the opening theme to the syndicated radio show "The Don & Mike Show" in 2003. ↑ "Billboard Singles". All Media Guide / Billboard. Retrieved 2010-03-07. 1 2 "Item Display - RPM - Library and Archives Canada". Collectionscanada.gc.ca. Retrieved 2016-10-13. ↑ "Lyrics: She Did It by Eric Carmen". Top40db.net. 1977-08-27. Retrieved 2016-10-13. "Explain It to My Heart"
"You Come to My Senses"